The digitization Project is moving along nicely! 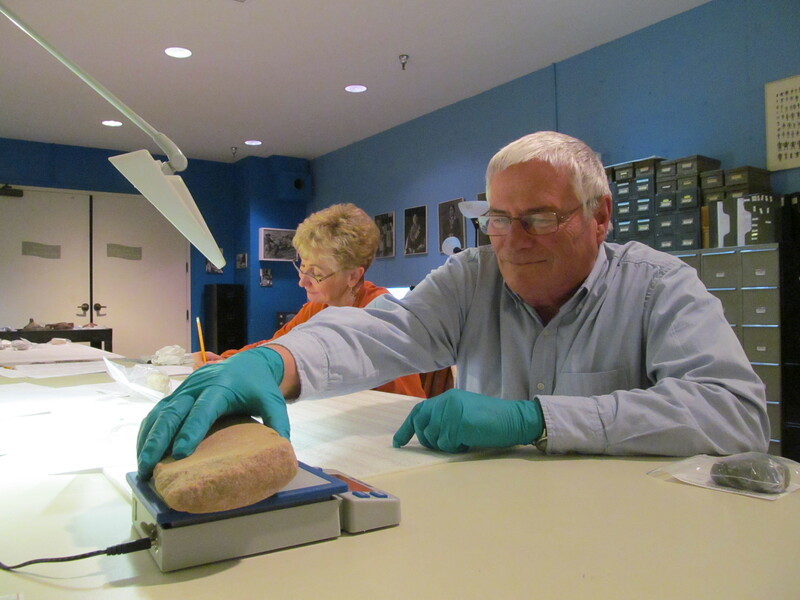 Ranger Ethan guided volunteers Ron, Brian, Carolyn, and Jack with measuring and photographing artifacts in the basement of the Museum of Indian Arts and Culture. Artifacts included complete pots, pendants, groundstone tools, and ceramic pipes. Some of the pipes had heavy residues and decorations on them and quickly became the most popular artifacts of the day. Overall the group processed about 40 items today. Ranger Annie and volunteer Diane were working hard in the basement of the Laboratory of Anthropology reading and scanning historic documents that pertain to Kuaua. They ran across interesting documents regarding the 1934 and 1938 excavations at Kuaua. They also found documents that revealed new information about the prehistoric adobe construction of Kuaua pueblo. Overall this is proving to be a very interesting project, and every week when we visit the curation facilities in Santa Fe, we learn a little more about our site. Be sure to check back for updates! Tags: Archaeology, Archives, Artifacts, Coronado Historic Site, Data Collection, Digitization, Historic SIte, Kuaua, Laboratory of Anthropology, Museum, Museum of Indian Arts and Culture, New Mexico, Photography, Ranger Ethan, Southwest. Bookmark the permalink.